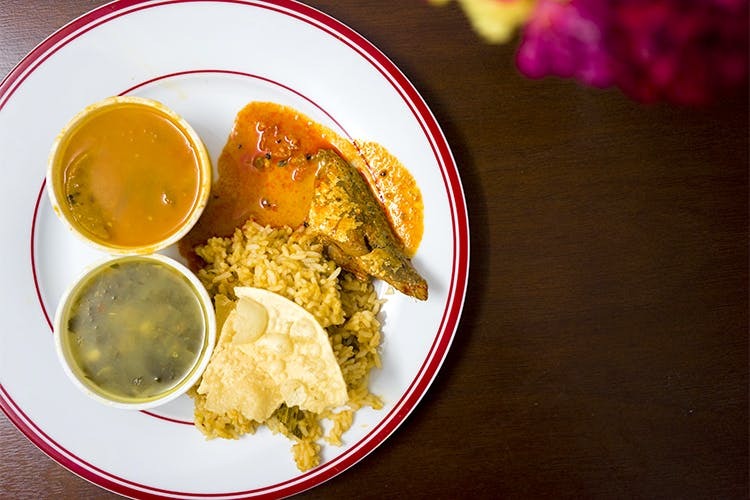 Both homesick and wannabe South Indians will find comfort in the Malayali food served by Kerala Lunch Home, a small eatery in Goregaon. ‘Will you be open at 5pm?’ we yelled into the phone in the morning, not because of a streak of rudeness, but, as we’re sure you understand, a case of network. Finally after having successfully communicated that we will be coming, when we arrived – we found that they had kept the restaurant open just for us. A very small, humble space, Kerala Lunch Home began serving its first thali from Feb 16 this year. It’s owned by former employee of the Mumbai Aiport, Mr Varghese and his wife, and run with the help of his family, his son-in-law who was helping with the cook when we arrived. After meal began with being served with a glassful of kokum water, which was pink in colour. Then, a small bowl of freshly made sambhar was given and we lapped it up. The thali had a mix of rice/ roti, two sabzis, a papad and homemade lemon pickle. The non-veg thali was fish curry, a dal as well as plain rice and some condiments. The gravy for the fish was spicy, and the fish itself well marinated. Overall, the whole meal tasted like the food some of us had had on our travels in Kerala – with the right touch of coconut and love. A really filling veg thali is for INR 60 only, and non-veg one for INR 80. You can also just get a chicken or fish curry or fry here. For Onam, they have a special Sadhya that serves 22 items with two payasam dishes for INR 400 per head, for the weekend. Find yourself in Goregaon, you should go here for a simple yet flavour-packed meal.